VIDEO TESTIMONIALS : Hondon Villas would like to thank Nick and Lindsay for talking about their new llfe in the sun and their experience buying through Hondon Villas. Q. Tell us about your new retired life out here in Spain? N: It’s so much better, don’t you think? 100% better. L: Yeah. It’s getting away from the rat-race really [laugh]. It’s just so much more relaxing. I can’t pick one thing really. It’s a whole combination of things I think. N: Yes, we’ve met some lovely people here who have been very helpful, Spanish and English. L: There’s some really good restaurants, nice food and it’s given us the peace and quiet and the ability to relax in a way we couldn’t in the UK. L: We are looking forward to going to the Spa Baths (Fortuna) soon and the markets are a great place to go. We go with friends there and when we’ve done our shopping have coffee and relax usually sat outside in the sun. Yeah, it’s great. N: People have been really helpful actually. Both the Spanish and the English. Brilliant. Really great. L: People seem to genuinely have the time to stop and chat. Again it’s more relaxed than we experienced in the UK. Q. How would you describe your experience with Hondon Villas? N: They couldn’t have been more helpful without a doubt. They showed us properties that we didn’t imagine we would like. Which was really good as I had a set view of what I wanted. They showed us lots of different properties one of which we totally feill in love with and bought! L: … just impressed by their professionalism, kindness and friendliness. And after buying the house, just all the help we had to settle in, because moving to a new country is a quite daunting prospect even though we were excited. But they smoothed the path and the after-sales service was brilliant, better than we could of expected. N: Nothing every seemed too much trouble for them. They were always so helpful, friendly and willing with everything we asked. L: We always felt that we could just pick up the phone if we had a problem or a question. they just helped us every step of the way. They certainly made us less anxious than we would have been about the prospect (of buying a villa in Spain) because there is a lot of bureaucracy to go through but we always felt that Hondon Villas could help us find the answer. L: I don’t know if any other estate agent would go that far to make us feel at home. Hondon Villas will help you buy, sell or rent your Spanish property in the Hondon Valley, inland Costa Blanca, Spain. We have been the first choice of local agents for over 10 years. Our local knowledge, AIPP member standards and 30+ years in Real Estate have made us the top selling agent in the area! With 1.5 million visitors to our main website & counting & TWO LOCAL OFFICES we are the first local agent to offer lowest pricing, drone videography and free document checks to our exclusive clients! Hondon Villas suggest you join us for the Good Life! Having lived and worked in the Hondon Valley for years we know the area quite well and the best bit of being in Real Estate you get to see more of the geography than most! Here is a short video that might just give you an idea of it’s beauty and tranquillity. Here we can only give you a glimpse of the local Hondón countryside and towns but we hope you understand why we love the outdoor lifestyle here. So, yes the Hondon Valley has become one of our offices (well the best one really!) as we value, list or sell homes for our vendors. As you can see there are some excellent vistas that are a delight in all seasons! Please we suggest you make time for a country walk or drive through the old “camino” roads. You will just marvel at the changing light, shadows, rural settings and picturesque skies. The Hondon Valley is well known for its mild climate and pleasant summer breezes, which is very welcoming in those hot summer months when temperatures rarely fall below 30 degrees. The region enjoys sunshine in excess of 310 days per year, where the air is very clean and the pace of life slow. Hondon offers a very peaceful and stress free life. Come take a look at the Valley of the Vines, drink the local wine under the bluest of skies and feel the warmth of the Spanish sun on your face … and you’re hooked! We were! We love it! VIDEO TESTIMONIALS : Hondon Villas. 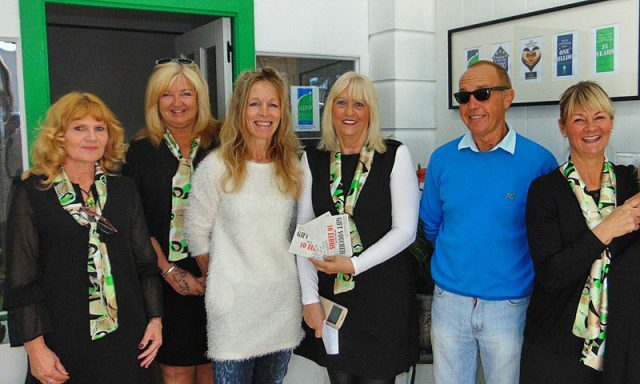 Irana Davidson talks about her experience buying her Hondón Valley home through Hondon Villas. What was the main reason you chose the Hondón Valley? We actually fell in love with the village to start with (Hondón de los Frailes). We sat at the 28 Restaurant and we looked down the village and we saw it had everything we imagined we wanted. Why would you recommend Hondón Villas? The name “Hondón” being associated with Hondón Villas seemed a natural choice. As I said before, we were never pushed into looking at any property. We looked at properties that we chose. And when we decided on the property we wanted it then became a real hand-holding process. Not speaking Spanish it (the buying process) became quite daunting. But everything was basically done for us. We were taken to the notary. We were given real good advice. And once we had bought the house it was more hand-holding. And we felt we were looked after. They were more friendly than a lot of places we went to. We were not pushed into looking into anything, it was what we wanted to look at. How do find the social side of Hondón? I think the first social event I went to, I was invited by Maureen from Hondón Villas. She invited me to the Ascot Ladies Day which was fabulous because at the time Charlie (my husband) was away in Scotland for a wee while so it was a fantastic way for getting to know people. You do feel like you can walk through the village and people will speak to you. You can go for a coffee and someone will speak to you. … we rescued a dog and you get to know people through that. I find it very social here. We get asked about restaurants and bars available in the Hondon Valley areas. There are plenty to choose from in Nieves, Frailes, La Romana, Abanilla, Fortuna and the surrounding areas. 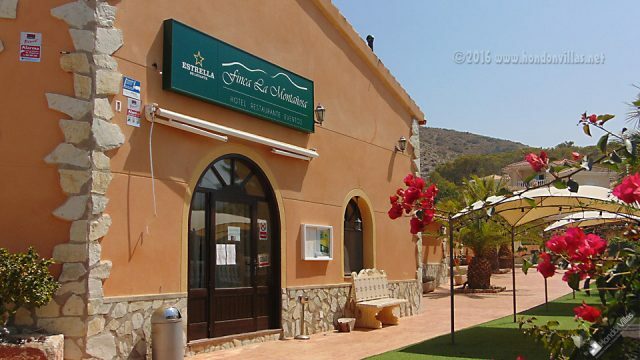 Here we list bars and restaurants for Hondón de los Frailes. There are Hondon restaurants and bars to suit all pockets / budgets. They do change owners and menus on a regular basis so we advise you ask locals or call the restaurants direct. Or you can check out Tripadvisor (or similar) for more up-to-date reviews. As we all have different tastes and expectations we shy from full reviews, ask around or better still go and make your own mind up…. But is is important to show support for local trade after all. Use ’em or lose ’em. the premier and local Estate Agent for the Hondon Valley. 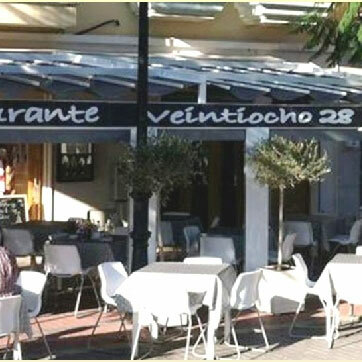 The most established is Restaurante Veintiocho 28 in the main Frailes plaza, opposite the Town Hall). At the time of writing, 28 is owned and run by Simone and Marcus and boasts plenty of outside sunny seating, a shady canopy (from the sun and the odd rain shower), a small inside bar and larger a-la-carte restaurant. The menu is varied British / international. Open most days for breakfasts, drinks, lunch and dinner with many specials, “Sunday Roast”, snacks and full 3 course dining “menu-del-noche” . It is well regarded as a clean and friendly catering establishment with food to match. It attracts all nationalities of the area (British, Dutch, Spanish, etc …). They have a 28 Facebook page. They also cater for special occasions and parties. Infinity: The new kid on the block. Formerly a tea shop, this one is on the main road CV-845 through Frailes and currently run by local residents Jay and Natalie. You can dine inside in pleasant clean surroundings. At time of writing they are open selected evenings and Sunday lunches. Call 622956544 for full details and menus. La Buena Vida: (2019 this now has limited opening or special event catering). This opened about 8 years ago as an Italian themed restaurants but is now more international cuisine now with full a-la-carte dinner menu, “menu-del-noche”, early birds, “Sunday Roast” and chef’ specials. This is located just off the main plaza in Frailes and has an ornate decor and plenty of inside seating with a greetings lounge. The atmosphere is relaxed dining and smart casual dress code. They also cater for special occasions and parties. The same owners of La Beauna Vida also run “The Irish Bar”. 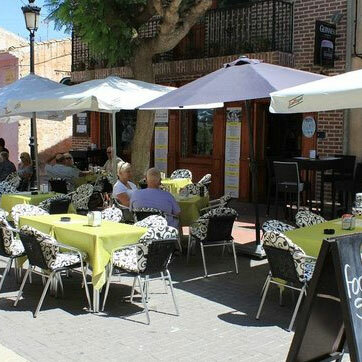 El Nuevo Valle: This popular plaza bar and snack restaurant is in the main plaza opposite the church. They serve drinks, inside and out, with a fast-food snack menu all week and specials for steaks, pizza, Chinese and the Brit classic “Fish n Chips”. They also offer a large screens sports area which doubles as a meeting / party room and live music venue. 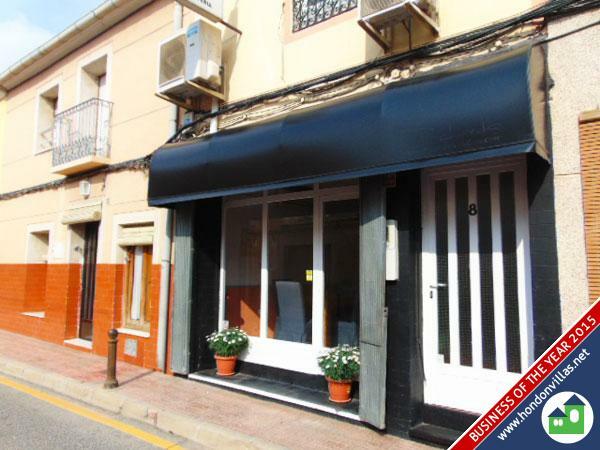 Caramels: This Spanish run and recently refurbished bar is popular with all nationalities. It is mainly a bar with some outside area at the back for music / food if pre booked. They are predominantly a drinking establishment with sports TV, bandit machines and a pool table. This is on the main through road in Frailes, near the garden centre CV-845. Pepins: Another well established Spanish owned bar and occasional restaurant. they also do Tapas and snacks. This is often used by local social groups as a meeting place, bingo, quizzes, etc. A friendly and welcome bar and popular with Spanish workers at breakfast and lunch. This is on the main through CV-845 road in Frailes, near the grocer’s shop / lottery shop. 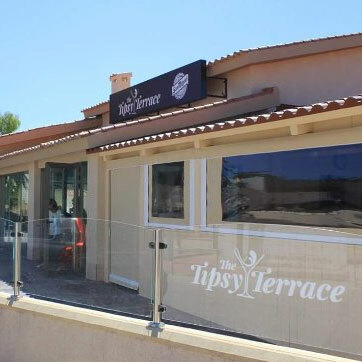 Tipsy Terrace: The new kid on the Frailes block… built from an old house at the end of the main street it has a varied menu and personality of its own. Breakfast, snacks and dinner menus available. They also do private functions. El Fogon del Friars: The largest venue, Spanish run and just out of the village as you head out towards Barbarroja / Macisvenda on the CV-845. This has a large car park, shaded terrace and large restaurant inside. There is a large courtyard to the back that is used for larger events / music. It is popular for breakfast and lunchtime “menu-del-dia” but evening menus and events are only occasional. The food is typical local Spanish / tapas. Punjabi Virsa: The locals have been wanting an Indian restaurant for a while and now we have one. It is at the quieter garden centre end of the village plaza, near Tipsy Terrace. It’s already proved popular with mixed reviews in the early days but is now well established and offers a wide variety of spicy dishes. The also offer a menu del dia as lower prices than the evening meals. La Finca Restaurant, Hondon Valley. They offer about 100 typical Indian dishes in clean surroundings. The large dining area is inside with the kitchen and bar to the back. They also offer an early bird priced menu of three courses with poppadoms and drinks included. A magnificent façade, garden and terrazzo is in the middle of a new build development. Converted into a B&B, bars and restaurant this has the look of an old Spanish hall but with all the mod-cons. It has had a chequered history with many owners trying to make a go of it. As we write it is run by Dutch & Spaniards and seems to found its niche in Spanish food and culture with live music and value menus. Being so large it can cater for large parties, events and fiestas. The opening times and days vary and they tend to have limited opening days in the winter so please check before you go. … so look out for our next article on the bars and restaurants in the sister village of Hondón de las Nieves. Who needs a Drone? ?+++ Google Earth Video +++It was such a beautiful day today I decided to extend my Sunday walk further than I normally do along the playas! I walked from Albir to as far as Restaurante El Cranc Chiringuito, L'Olla beach near Cap negret. I am so glad I did even though I overdid the walking and hurt my leg! There are some nice "hidden" gems along this way, I guess this time of year it's better. Anyway, as I have also been learning Google Earth I compiled a "flight" to show the Albir / Altea coastline… (Google Earth is pretty amazing!!) Hope it's useful and interesting… and sorry, but it's me playing the guitar soundtrack! 🙂 Have a great week. We love Albir! VIDEO TESTIMONIALS : Hondon Villas. Sue and Dean Savage tell us why they would recommend Hondon Villas… We are pleased to be the first local Hondón agent to use Video Testimonials… watch out for more soon. I think because you don’t feel pressured into buying something. And you know that you are being looked after. We’ve looked at lots of houses before we came to this one and the one thing that I felt when we were with other agents is that they were working for the vendor. But with Maureen we felt she was working for us as well. We’d been to other agents who we told what we wanted but they still took us to other properties that were no where near what we wanted, just because they wanted to show somebody that the agent was taking us to their house. Where as with Maureen she just showed us… she was working for us and was honest with us. She’s say, ‘That is not right for you’ or ‘yeah, ‘I think this one is’. That’s why I would come back (to Hondon Villas) and use Maureen again. “You just felt safe. That is the word I would use. You felt actually safe in her confidence”. Because we were in Maylasia, everything had to be done through Hondon Villas. Maureen made that really easy and helped us with moving in, what was left in the house … actually, the whole package. And you just felt safe. That is the word I would use. You felt actually safe in her confidence. And picking up from that, when we did arrive (in Hondon) the after sale package was really useful and helpful. Actually meeting us at the house with the keys to make sure we happy and OK. And whenever we had a problem, Maureen and her team have been on the end of the phone. So all we had to do was give them a call or walk into the office and nothing was too much of a problem. Hondon Villas are a featured agent on the Channel 4 TV “A Place in the Sun” program and a AIPP member committed to better standards. ( here is the Google map ) . We are delighted to be part of and perform to the Real Estate standards of the AIPP (Assoc’ of International property Professionals). It’s a fact, no other local agent has the experience or level of service we can offer. Thank you Len Ridgway: “We would like just like to say and let it be known that credit where credit is due! Mo (Maureen) and Saff of Hondon Villas have given us excellent service and been the most helpful and professional agents to us and we know many many other people as well. They have always gone the extra mile for us and its most appreciated. We would still and have recommended them to lots of people 🙂 … Said it before but if you want to sell your property professionally then go with Maureen, she’s the best :-)”. And we live here, know the people, know the facilities and have helped 100’s of people buy homes or settle here. We are “Hondon Villas” and we sell Villas in Hondon. Our professional perseverance is paying off… we are on a roll as we have sold another 2 properties this week. Watch our on line channels (such as Facebook / Twitter / Google+) for updates. Hondon Villas concentrate our estate services in the Hondon Valley and the surrounding villages. Everyday we deal with Hondon buyers, sellers and renters. We prefer not deal on the coast as we want to look after our special local community. Here are some nearby towns and villages close to the Hondon Valley: Albatera, Algorfa, Algueña, Almoradí, Aspe, Balones, Benejúzar, Benferri, Benijófar, Benissa, Callosa de Segura, Cañada del Trigo, Catral, Cox, Crevillente, Dolores, Elche, Elda, Elx, Hondón de las Nieves, Hondón de los Frailes, Hondon Valley, La Romana, La Montanosa Urb Villas, Monforte del Cid, Monóvar, Novelda, Orihuela, Pinoso, Rojales, San Isidro, Santa Pola, Sax. All of them little jewels in the Hondon Valley Crown! VISIT HONDON VILLAS ONLINE or in PERSON! Hondon Villas are featured agents on A Place in the Sun. We promote and sell luxury Spanish villas and homes inland in the beautiful, quiet inland area of rural Hondon Valley, Alenda Golf Villas and La Montanosa areas of the Costa Blanca, Spain. You can search for villas and apartments in Hondon de las Nieves, Hondon de los Frailes, La Romana, Fortuna and Albatera radius of the Hondon Valley. or visit our main websites for our latest properties. and by appointment at weekends. OFFICE #2 Hondon de las Nieves Plaza is open Tues to Saturday. We look forward to meeting & helping you find your dream home in the sun! Hondon Villas are proud to offer for sale this beautiful and immaculately presented exclusive Listing. This lovely three bedroom Villa situated on a secluded plot is only a short drive to Hondon De Los Frailes village. The property is accessed down a private driveway leading to gates where the property is set back onto the plot. Internally the Villa is beautifully presented through-out in tasteful neutral colours and is very light and airy. The property offers three double bedrooms,two with fitted wardrobes and the Master boasting a spacious en-suite and a family bathroom. The upgraded fitted kitchen which is accessed via the utility room benefits from an integrated dishwasher, fridge and double oven and is large enough for a table and chairs although there is a separate dining room and an office area. The living room has a lovely feature fireplace and doors leading out onto one of the terraces overlooking the village. Externally the property sits on a manageable sized plot and benefits from a garage,car port and shed. Set to the the rear is the 8×4 m2 swimming pool and a second wooden covered terrace which is perfect for outside entertaining. With spectacular views of the village and mountain range an early viewing of this property is highly recommended as it will not be on the market for long ! Hondón Website, 1.5 Million and counting…. Thank you to our 700 Facebook followers and 1.5 million website visitors. We appreciate all your support for local businesses and welcome your Likes, Shares and Comments on our online channels such as Facebook, Twitter and our Blog. Please continue to share and recommend Hondón Villas, Buy, Sell or Rent in the Hondón Valley. Real Estate Agents, Spain. 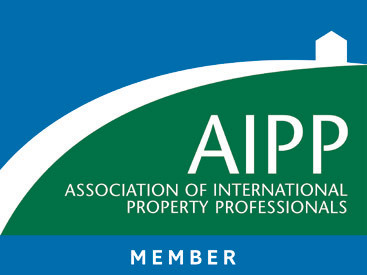 We are into our 5th year as a member of the AIPP which sets out professional conduct and ethics for Real Estate agents globally. We are the only Hondón agent to win the Business of the Year for the whole of the Costa Blanca. 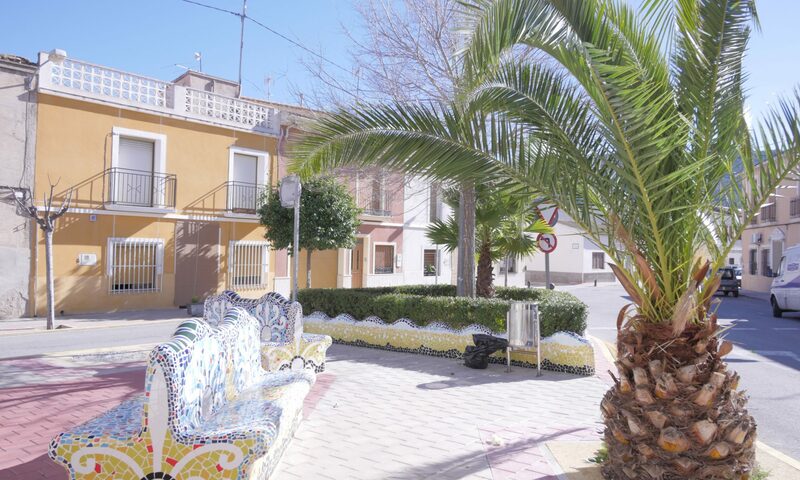 We have two local offices in the main village plazas for Nieves and Frailes of the Hondón Valley. We are local and employ local people who know the area well. We list and sell more houses than any other Hondón agent in the area. We lead and they try to follow. Maureen Cook, the owner and director, has more professional experience in Real Estate and financial services than any other agent for miles. She is trained and been rewarded for sales targets and competency at a corporate level for over 30 years. She prides herself on being honest, fair and giving personal service. She lives and breathes property!